If you’re searching for cheap centerpieces that will make your wedding tables look like a “million bucks” you have come to the right place. Listed below are some fabulous ideas that will inspire your imagination and help you create beautiful centerpieces. Take a trip to a dollar or other discount store and purchase a clear vase. Place some marbles or cut crystals (also purchased at a discount store) in the bottom of the vase and then fill the vase with fresh flowers from your garden or supermarket. You can add baby’s breath, ferns or any other filler that you like to make the arrangement appear more lavish. Depending upon the season of your wedding, you can purchase cheap potted plants at a supermarket, farm or wholesale florist. Purchase foiled paper (that coordinates with your color scheme) and wrap the paper around the pot, then place the potted plant in a decorated wreath. If you don’t want the added cost of a wreath, make a bow and place the bow in the pot. The soft flickering light created by candles creates a sense of intimacy and romance. "After season sales" are the perfect time to purchase candles for your table arrangements. Buy candles in varying heights and place three on a tray and scatter small stones, seashells, or colored glass around the candles. Another really cheap table arrangement can be created by purchasing one, ten inch round candle and hot glue pearls and ribbon to the center of the candle. If you want your table arrangement to be a little more elaborate, place the candle on a round mirror and scatter rose petals or ivy from your garden on the mirror. Cheap Centerpieces that are edible too! Since you don’t want to blow your wedding budget on your centerpieces, how about having your beautiful table arrangements be edible too! 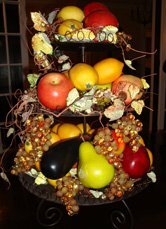 Not only do fruit centerpieces look festive, they also will serve as a desert along with your wedding cake. One wedding, where the bride was particularly strapped for cash, purchased clear, cylinders of varying heights and added candy that coordinated with her color scheme. She placed three cylinders on each table; not only did they look great, but were functional too. 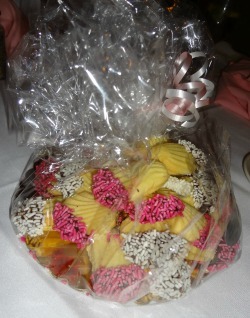 Another idea ~ place decorated cookies on a tray as a table arrangement. 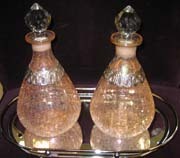 Fill two decorative decanters with wine (one red and one white) and place them on a tray. Your table arrangements will look great and your guests will enjoy the wine during your reception. 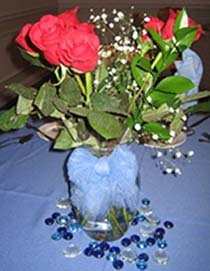 As you can determine, my ideas for inexpensive centerpieces doesn’t mean that you have to give up style or expression. You can use your imagination and create the centerpiece of your dreams. For more centerpiece ideas, click on my links below. Need more advice? Check out my welcome page!